All set! Let’s do this thing. And sliding down the ski jump tower. Or giving a Yeti a shower. Chorus: La, la, la, la! And snow angels that really fly. Or just shovelling snow off the drive! Phineas: Well, they can’t all be fun. So stick with us ‘cause Phineas and Ferb are gonna spread some Christmas cheer! Candace: Mom! 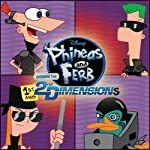 Phineas and Ferb are making a Christmas Special!